Here is one of my favorite songs from the movie Nebraska (2013). The whole soundtrack is done by Mark Orton. In this movie Alexander Payne (director) does a great job portraying the lives of most North Americans. The main character, Woody Grant (Bruce Dern), gets a sweepstakes in the mail saying he had just won $1million and he had to go pick up his prize in Lincoln, Nebraska. He lives in Montana, and the movie revolves around his 860 mile journey with his son David (Will Forte), an electronics salesman, to Nebraska (and there comes the name of the movie). 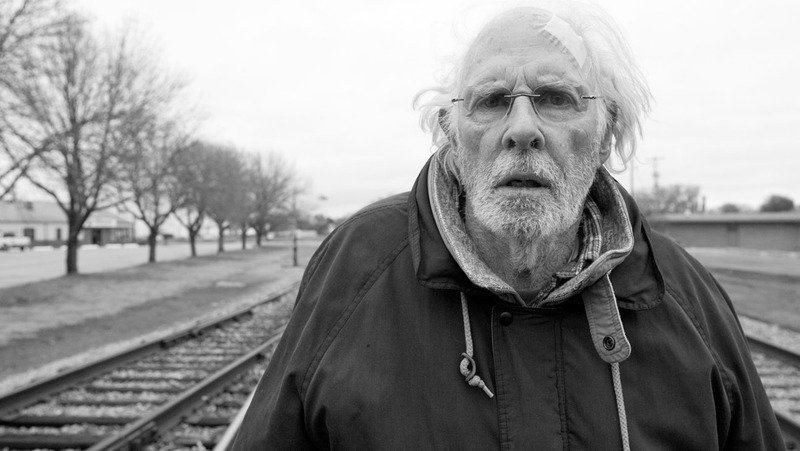 Woody Grant (Bruce Dern) in Nebraska. As the film develops, Woody’s family keeps telling him how crazy he is and that he has won nothing. But his son decides to take him to Nebraska because he feels that his father should leave his home for a while, since his monotonous life had been taking the best of him for the past years. On the way to Lincoln they stop at Woody’s home town where everyone greets him with joy after finding out he was the newest millionaire around. People begin bringing up past stories of how they had lent Woody money years ago and now it is only fair of him to pay them back. However, Bruce Dern does a great job portraying a confused man who seems to have had his life sucked out of him throughout the years. He never gets angry, nor happy. He just coasts through all these frustrating experiences, while his son stands up for him when people try to take advantage of his dad. With a great soundtrack done by Mark Orton which fits perfectly well with the atmosphere of the film, the viewers keep expecting something great to happen. But nothing ever does. When we think that something is building up, the outcome is nothing short of a disappointment. But isn’t that what life tend to be? “That Moment” tends to always be just a quick rush. Nothing outside of norm. As you might notice when watching the movie, the picture is in black and white. You should get that right after you press play. Alexander Payne does that with the intent of portraying the lifeless and monotonous spirit of Woody Grant. And as the film develops, of everyone else. Payne does a great job by throwing in small hints here and there of Woody’s qualities (always doing things for others without expecting anything in return), and his defects (cheating on his wife years ago). It seems like all these things go unnoticed by the characters, they don’t give much value to anything that is being disclosed. And Woody is indifferent about it, as well. He doesn’t seem to care all that much. All of these things are so subtle that they also go unnoticed by the viewers. In life society is constantly trying make us conform to the reality around us. We are in the constant battle of balancing our disappointments with our dreams. As humans we tend to believe in everything we are told, and often we end up hitting walls, just like Woody did. And just like that child inside all of us has in the past. We all have a little bit of Woody Grant in us, a far from perfect hopeful soul tirelessly striving towards “That Moment” which we all believe is just around the corner. Although, some of us might experience “That Moment” in life (mostly during our teenage years), the vast majority of people won’t. Nebraska is the perfect real life drama. Something we can actually relate to.